Bierria is the first repeat winner of the prestigious Guy Flaherty Award since Jake Locker. For the second year in a row, senior linebacker Keishawn Bierria was named the Huskies’ winner of the Guy Flaherty Award, considered Washington’s oldest and most prestigious team honor. Bierria is the first repeat winner of the prestigious Guy Flaherty Most Inspirational Award since Jake Locker in 2009-10. In the 110-year history of the award, just three other Huskies have won it more than once (Tom Wand, 1911-12; Don McKeta, 1959-60; Jordan Reffett, 2006-07). Bierria also won the team’s Academic Achievement Award, along with senior center Coleman Shelton. 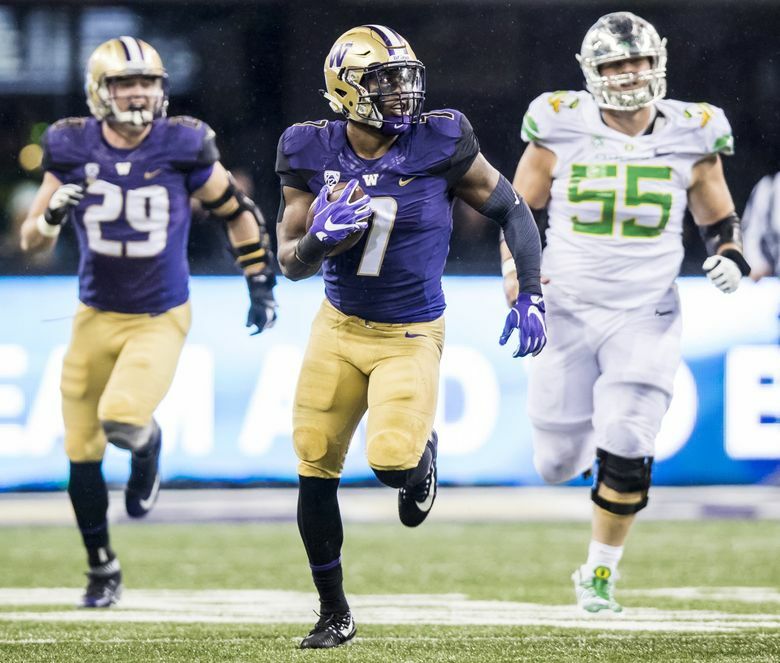 Junior running back Myles Gaskin (offense), junior defensive lineman Vita Vea (defense) and senior receiver/punt returner Dante Pettis (special teams) were named the team’s most outstanding players. Junior linebacker Ben Burr-Kirven and senior tight end Will Dissly were named co-winners of the Husky Excellence Award. Shelton also won the John P. Angel Offensive Lineman of the Year, and junior Greg Gaines was named winner of the L. Wait Rising Defensive Lineman of the Year for the second year in a row. Running back Salvon Ahmed and tight end Hunter Bryant shared the Travis Spring Freshman of the Year Award. Sophomore cornerback Austin Joyner was also honored with the Chuck Niemi Big Hit Award, while sophomore corner Myles Bryant and junior offensive tackle Kaleb McGary shared the Earle T. Glant Tough Husky Award. Senior outside linebacker Tevis Bartlett won the Academic Achievement Award and junior tight end Drew Sample (Bellevue, Wash.) was the winner of the Don James Perseverance Award. The Bob Jarvis Offensive Scout Squad Player of the Year went to freshman quarterback Jake Haener , the Mark Drennan Defensive Scout Squad Player of the Year was given to junior defensive back Sean Vergara, and the Brian Stapp Special Teams Scout Squad Player of the Year Award was presented to freshman linebacker Ariel Ngata.